Seriously? Perhaps The Stand deserves chance to be seen but Jericho? That series went nowhere after the first season, and I never need to see that again. Arrested Development? More people talk about that show than ever saw it or would sit down to watch it again. But the Firefly fanbase continues to grow, and that isn’t rocket science. Joss Whedon may not actually walk on water, but with the success of The Avengers under his belt (as well as Buffy) it’s hard to say he was wrong in creating Firefly and I can’t think of a better property that could be revisited given the chance. 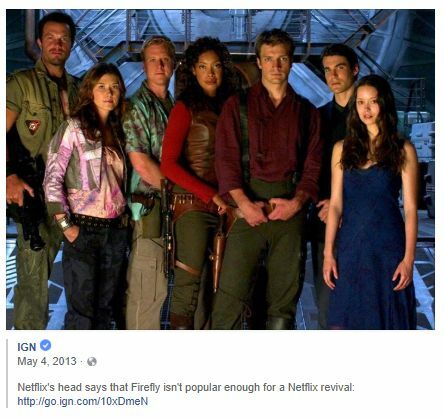 The problem isn’t Firefly, it’s Netflix. Imagine just for a minute that there were more than thirteen episodes to watch in the first place? It’s kinda like imagining that you could watch Babylon 5 as J.M. Straczynski first outlined it. What kind of show would that be? The leadership at Netflix clearly lacks the imagination to create Science Fiction content on that level. Facebook status backdated to the blog. They still don’t do SF on Netflix. Superheroes? Yes. SF, no.